Today, I woke at my usual time from cat nudges and purrs in my ear, made myself some iced coffee and said goodbye to Marc as he went to work. Once the door closed, I set to work staging and photographing my latest piece – a gorgeous oak washstand. I bought this piece from a local hardware store (of all places). I was there returning the keys to a U-Haul we rented for the Spring Barn Market back in April, and as I wandered around, I saw it hanging out by some boxes. After opening and closing the drawers and doing my usual inspection, I totally fell in love with it. There was no price on it, but I thought I would ask if it was for sale…just in case. Much to my delight, the owner gave me a price and while it was a bit higher than I wanted to pay, it was in such good shape that I sprung for it and loaded it up into The Marshmallow. This washstand sat in my basement workshop for a few months because I wasn’t 100% sure what I wanted to do with it. 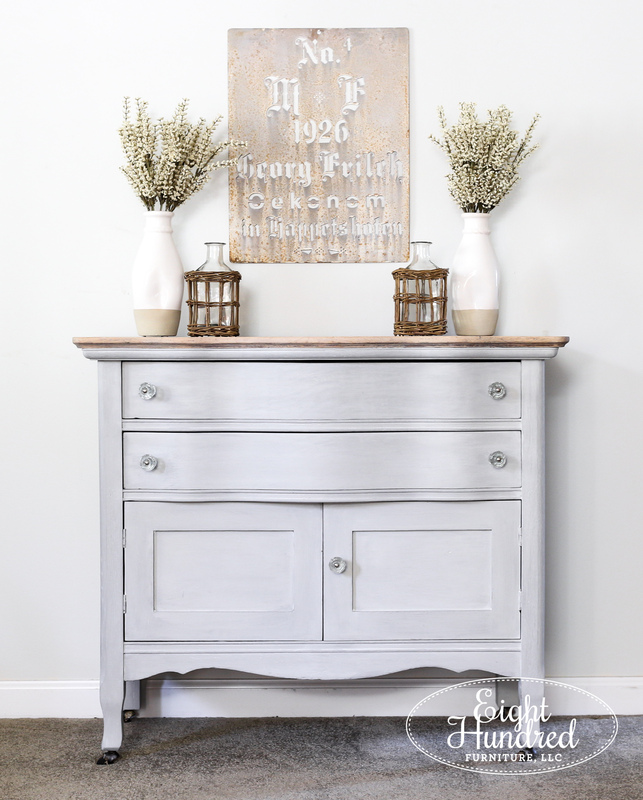 There were thoughts of painting it red and accenting with Antiquing Wax, or leaving it natural and sprucing up the golden oak finish or even a totally crazy idea of stripping the entire piece. And so, it sat untouched until my list of commissioned work got down to a more manageable length. 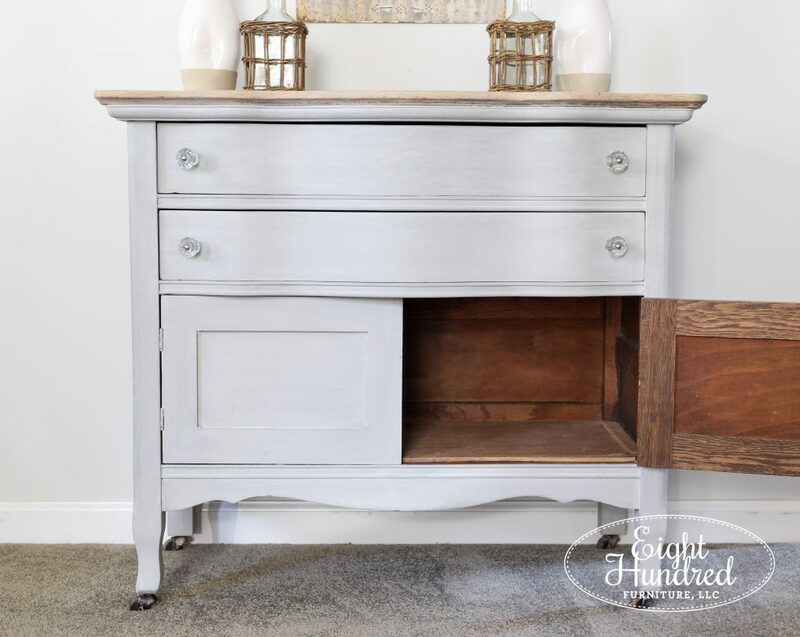 When I had time to squeeze in a retail piece, I pulled the washstand out and decided to ease into its makeover by stripping the top. I still wasn’t sure what I wanted to do with it, but I figured that getting the top cleaned off would help get the wheels turning. And turn they did! The top of the washstand stripped and sanded down beautifully to a lovely pale state. 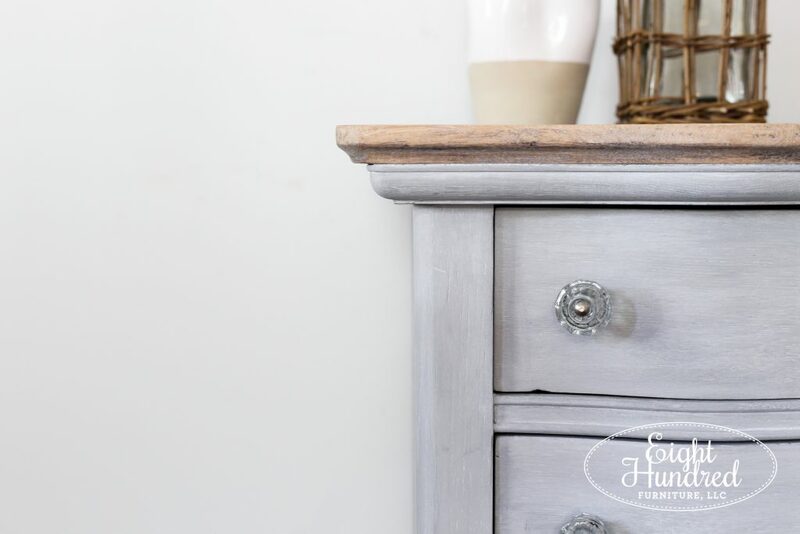 I thought the top was just the prettiest darn thing, so I wanted to continue with the light and airy look by painting the base with a very light gray. 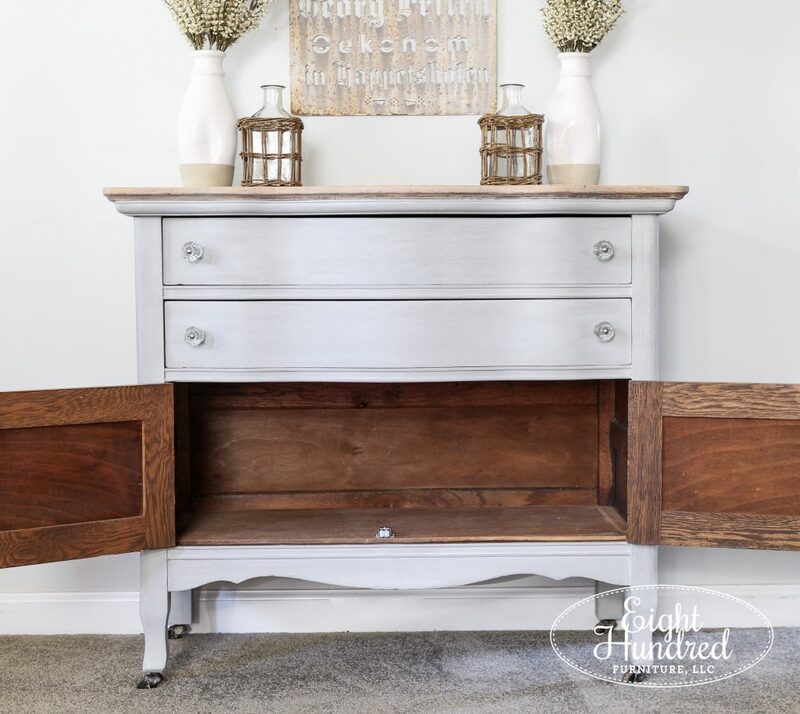 After giving the base a light scuff, I mixed up a custom blend of 2 parts Grain Sack and 1 part Trophy from Miss Mustard Seed’s Milk Paint and added in some Bonding Agent so there would be no chipping. What’s interesting about this piece is that it came together gradually. As I completed one portion, the next sort of “opened up” to me. I made my design decisions one by one, taking into consideration what I had just finished. The top inspired the color. The color inspired the topcoat. The topcoat inspired the hardware. So that’s why I’m calling this piece a “gradual washstand”. 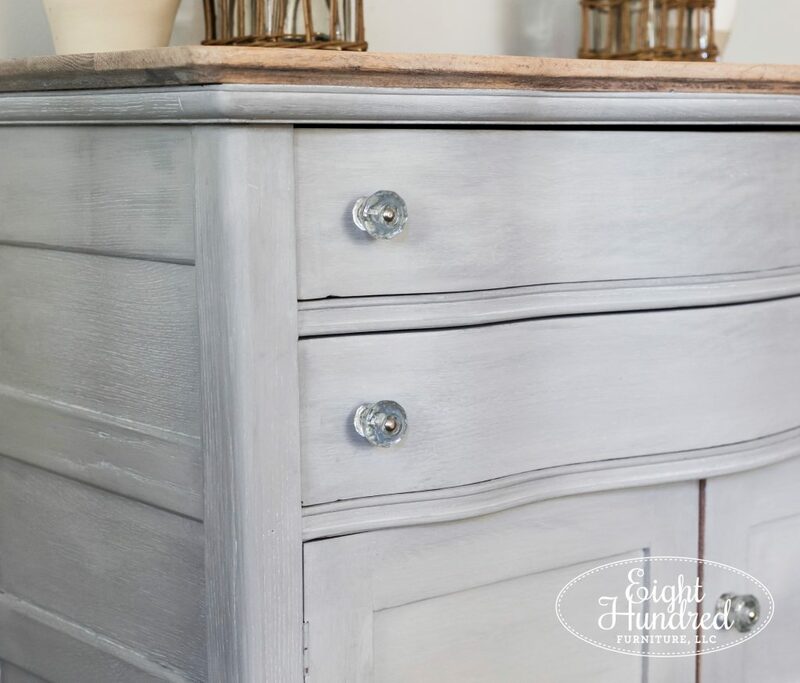 Once my custom MMS Milk Paint color had dried, I thought it would look lovely complimented with White Wax. Usually I apply some sort of clear coat in between the paint and the White Wax, but for this piece, I rubbed the White Wax directly on the paint. 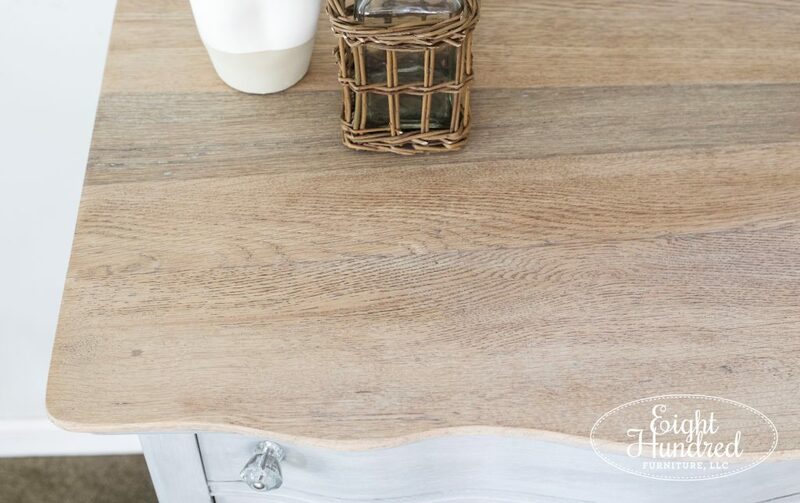 I wanted very muted tones in the finish and wasn’t too concerned with my usual crispness. I’m totally gushing over the light and airy feel of this piece. 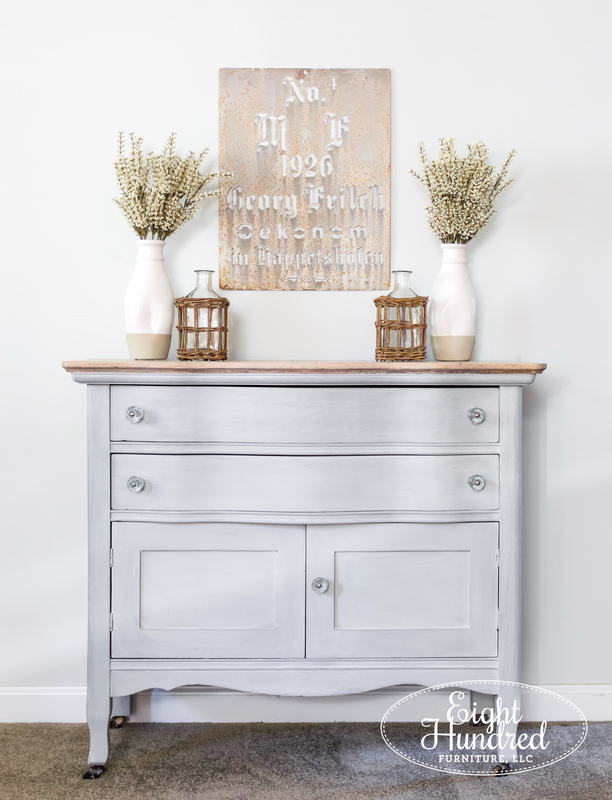 The light gray custom color that I mixed up is simply gorgeous. White Wax was the ideal topcoat for this project too. 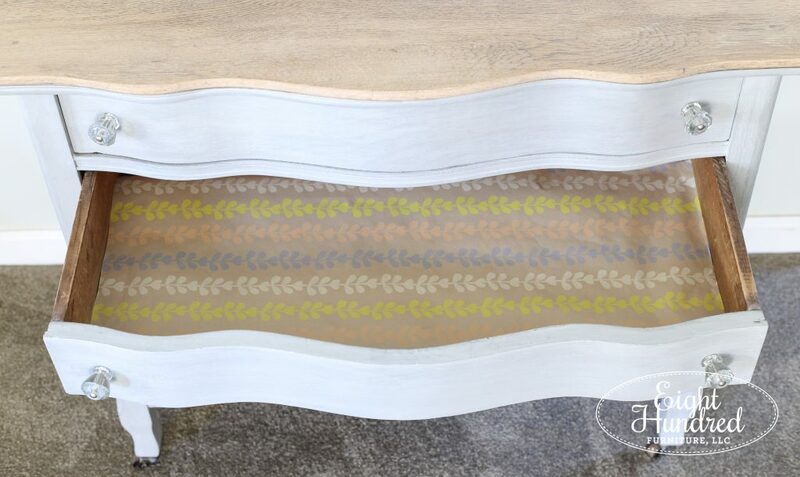 It got stuck in the grain of the oak, creating the perfect soft accent of white. 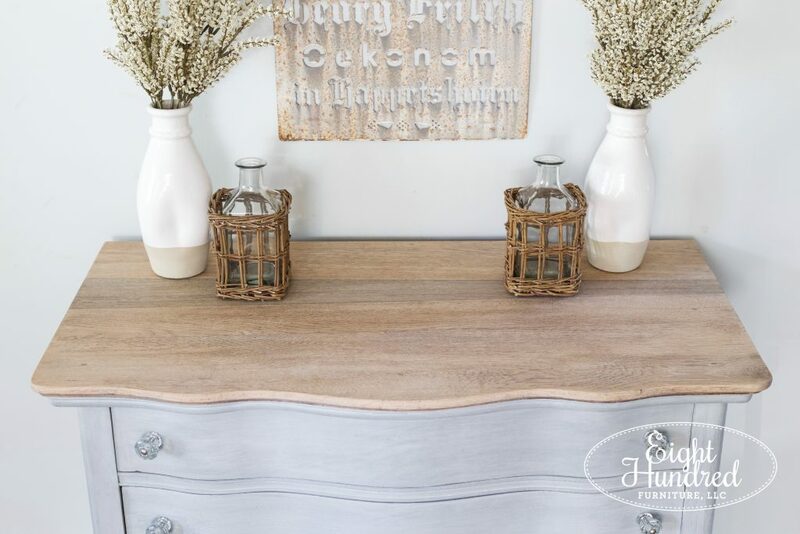 I even used White Wax on the top of the washstand, and applied it right over the raw wood. What’s nice about working with Miss Mustard Seed’s waxes is that they’re a topcoat in and of themselves, so you don’t need any additional product overtop. Just apply and let it cure. You’re done. 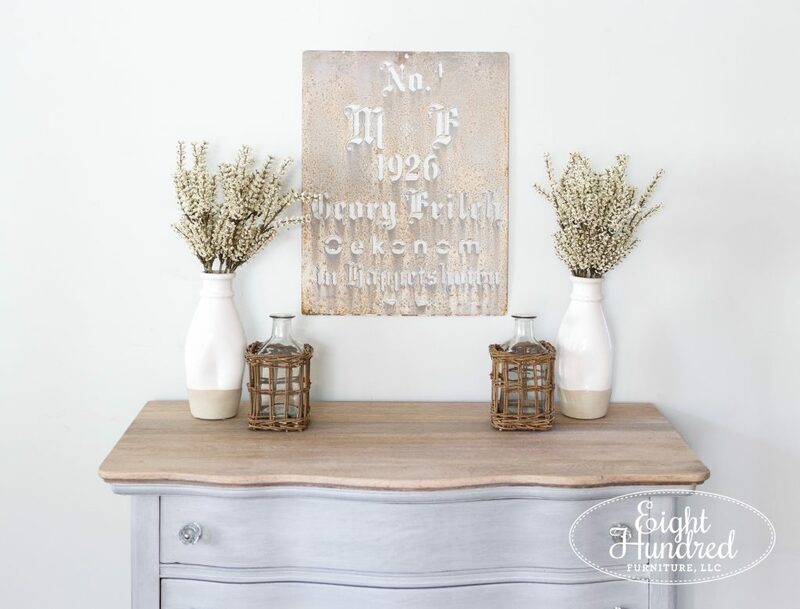 I’ve had this stencil in my stash for almost a year and it was the perfect addition to my staging pieces to compliment the washstand. 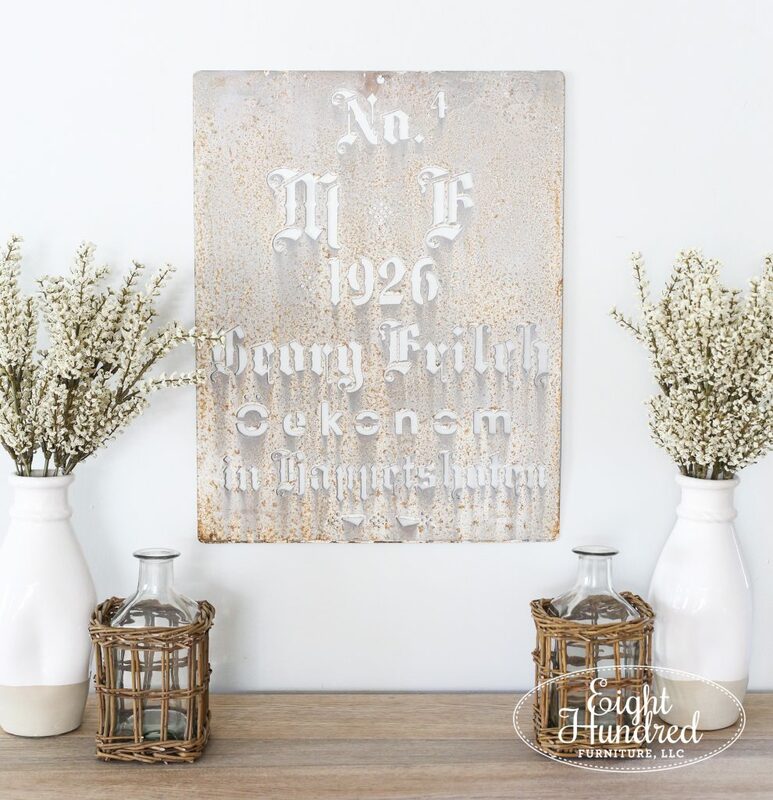 I have no idea what it says and I don’t think its an antique but it’s still really pretty to use on a wall. The drawers slide in and out smoothly and I added some wrapping paper to the inside to keep thing interesting. It’s not glued down or anything, so it can easily be removed or swapped out. The bottom doors were in great shape with one exception – there was no latch to keep them closed. So to remedy that, I installed a new ball-and-catch system to keep the left door shut. 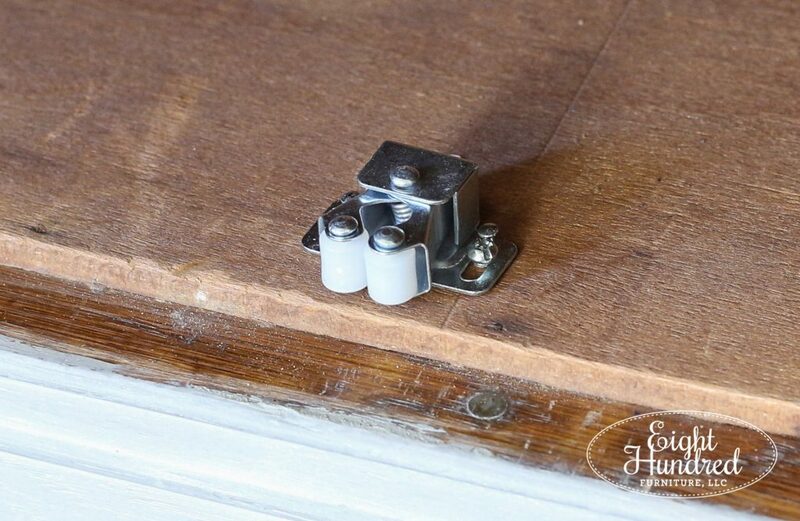 Now you can easily open the right door and the left stays in place. Or you can get really crazy and open both! 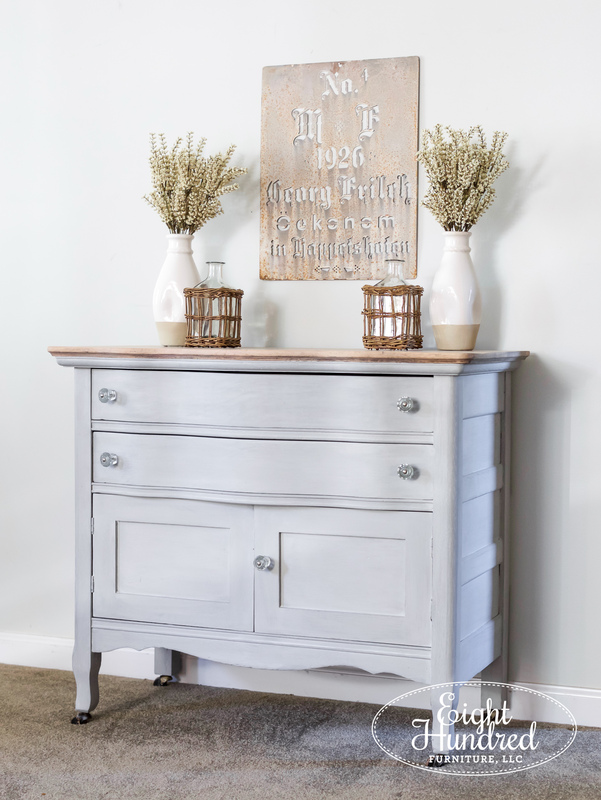 This washstand measures 34″ wide, 18.5″ deep and 29.5″ tall. It’s available for $215, so if you’re interested, send me an email and we’ll talk!